I consider myself a slightly-more-than-casual James Bond fan, but not a super fan. I’ve read the books and seen all the movies, but I couldn’t necessarily tell you exactly what plot point happened in what movie (especially the Moore years). I have a playlist of Bond songs on my iPod that includes all the Bond songs except one…more on that later. I like all kinds of books, so the description of this made me think it was something I might enjoy. Unfortunately, I was way off base on this one. THE COVERAGE: This is a very scholarly book that discusses the music of the James Bond films: the composers, singers, actors, and songs themselves. It covers all movies up through Skyfall; Spectre is not included. The book was released shortly before Spectre hit theaters in 2015. For some songs, the lyrics are broken down and analyzed along with the opening-sequence visuals. MY TWO CENTS: Oh boy, here we go. In fact, in the acknowledgments, they admit they are not fans of the movies or songs. So why, you might ask, did they bother with this particular subject? At least the “scholarly” aspect of it explains why the language used is often pretentious, including words I’ve never heard before. But then there’s also the part where the authors spew out profanity, especially one notable tirade against John Barry. So every time we whine about the fact that our favorite artist didn’t get picked, and some talentless hack did, some part of us surely is happy that we won’t have to navigate a complicated web of competing loyalties when the song comes out and sounds, well, okay, as okay as all Bond-songs sound. Competent, inoffensive, a bit staid. Seriously, even Paul McCartney doesn’t escape, described as being “no longer a young rock star” at age 30 when he did “Live and Let Die” and struggling to make himself relevant apart from the Beatles. He’s also described as “sort of safe” compared to artists that might have been picked, such as Mick Jagger and David Bowie. Adele is described as having “what few Bond-singers before her had: camp cred and a large gay following.” Even before I had the tenor of the book, I was terrified of what ire would be rained down on Duran Duran, but it really just seems to be lead singer Simon Le Bon who gets beaten up (part of the “voices that say nothing less than you no longer have to be able to sing to be a pop star.”) Broadway legend Tim Rice is slammed for his “half-baked lyrics” to “All Time High.” The lyrics for “For Your Eyes Only,” which I have thoroughly enjoyed since it was on the radio in 1981, are dismissed as “a huge f**king mess.” And of course “A View to a Kill” lyrics are roasted, with an insulting “nice songwriting, boys” thrown in. So do the authors like ANY of the songs? I don’t know why I was shocked when the one they lauded as “dynamite” was Madonna’s “Die Another Day.” This is the one song in all of Bond-dom that I do NOT have on my Bond playlist. I really dislike it. I’ve never liked it. And it’s not that I dislike Madonna, since I grew up to her. I’m sorry that her offering into the Bond song canon wasn’t more enjoyable. I’d much rather listen to “From Russia with Love,” although the authors toss that away with a “chances are you’ve never heard it.” Which again begs the question: Who do they think is reading this book? Someone who’s not a fan? Any fan interested enough to read this book would know the song. It’s just clear, over and over, that the writers have no clear view of their audience. They come across as egotistical enough to write a book ranting about something that’s not actually that important to them. You may ask: “Why did you read the whole book? Why not give up?” When I dislike a book this much, I like to give it every chance to change my mind. But I just kept getting more and more annoyed. I would read passages out loud to my roommate, who remarked, “This sounds like it’s just one giant troll post.” Yeah, it really does. Star Wars Fans still upset over George Lucas’s work on the prequel trilogy repress the fact that the original wasn’t a very good movie either. Wow. Just, wow. If this quote at come in the beginning of the book instead of 82% of the way through, I would have quit right there. 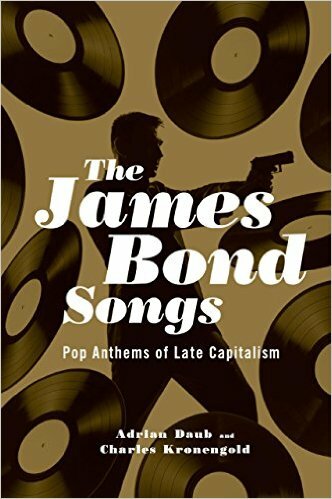 BOTTOM LINE: Not for casual readers, fans of James Bond movies or songs, or any of the artists who recorded Bond songs. Who does that leave? Maybe the population of scholars who thoroughly dislike Bond Songs? ON SALE DATE: Available now in hardcover and ebook formats.